Shortly before Thanksgiving, the Pew Research Center released findings from their latest Trust in Government survey. They found that: “Public trust in the government remains near historic lows. Only 19 percent of Americans say they can trust the government in Washington [D.C.] to do what is right ‘just about always’ (three percent) or ‘most of the time’ (16 percent).” In addition, they found the public is deeply cynical about government, politics and the nation’s leaders. However, they also found that the public is conflicted. Most are more frustrated than angry and most give government good ratings on handling many important areas including natural disasters, workplace standards, terrorism, safe food and medicine, access to health care and the environment. Most Americans also have long “To Do” lists for government. They want government involved in issues ranging from terrorism and disaster response to education and the environment. All of this reinforces what we’ve known for a long time: Americans feel alienated from their government, seeing it as “them” instead of “us.” And yet, these people also long for reconciliation. In addition, most Americans know little about their government and less about their responsibilities as citizens. Civics education isn’t on “the test,” so it doesn’t get taught in our nation’s schools. So how do we push back on the anti-government sentiment that pervades our society? 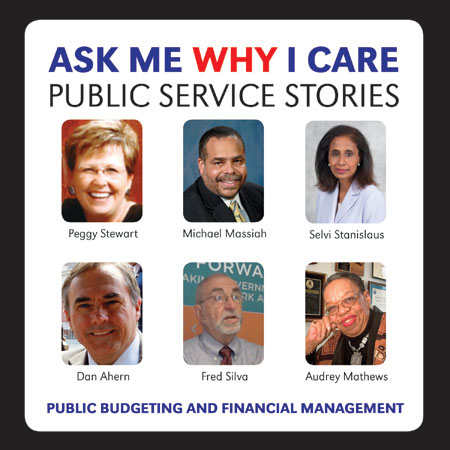 The Public Service Stories Project decided to do it with stories—stories told by people who are or were in public service; people who made/make a difference; people who love what they do and are proud of the positive difference they made/make for Americans. After all, the shortest distance between two people is a story! Think about the power of the commitment he described: a human response to an actual human interaction. Now think about how differently citizens would see public employees if they routinely heard such stories from them. We believe the power of those personal “real-life” stories is much more likely to move people than a rational, logical justification of government and government employees. That’s why we got involved in collecting public service stories as part of ASPA’s 75th anniversary celebration in 2014. We believe that asking public employees to tell their stories honors them, their commitment and the work they do, while reinforcing the nobility of their chosen profession. We also believe citizens need to hear these stories, so part of our work is to get these stories into local media, social media and classrooms. The Interviews Are Now Available! Interviews are available for use in the classroom, for mentoring students, for career counseling and more. Each group includes a set of suggested assignments for students. We are very excited about these videos. They tell wonderful, inspiring stories that cut to the heart of why public service matters and how fulfilling it can be for those who care. Isn’t that why we do what we do?? The videos are available at www.publicservicestories.com and the ASPA-Rutgers Virtual Museum of Public Service: http://www.vmps.us/main. Please help us get the word out about the availability of the videos. They are free, no strings attached. Download them, show them in class, assign them and watch them yourself. Be creative! We want them to be used so young people get a sense of the opportunities and rewards offered by public service! We don’t plan to collect any more video interviews. However, we do plan to continue our crusade to teach public employees how to tell their stories. We’ve done workshops on this topic since 2012 and our next move is to do a book. In the meantime, we would like to encourage all MPA and CPM programs to teach their students how to tell their STORIES as an indirect and, we argue, more human way to help citizens understand why public employees and the work they do are important and necessary. This project would never have been completed without the support of Dean John Bartle, College of Public Affairs and Community Service, University of Nebraska at Omaha (UNO). Author: ASPA member and former Executive Director Mary Hamilton is founder and director emeritus of the Nebraska Certified Public Manager® (CPM) Program at the University of Nebraska Omaha (UNO) School of Public Administration. Rita Paskowitz is a professional storyteller who, among many other gigs, is a faculty member in the Nebraska CPM Program and an adjunct for the UNO College of Education.